At Lemay Oil we take care to provide our customers high quality services personalized for their unique needs. We are available to speak to you during normal business hours. Our office personnel is professional, courteous and efficient. We offer automatic delivery and will call deliveries during normal working hours. Automatic delivery is based on the degree day schedule. The benefit of automatic delivery is knowing that you will not run out of oil, especially during the coldest part of winter. *Any automatic delivery customer who would like to cancel their service for any reason must contact the office in writing 10 days in advance and prior to next delivery so as not to cause any complications in service. If you fail to cancel in this time period Lemay Oil will not be responsible for any over fills, spills, damages or the like due to your breach of automatic delivery contract. In the event that you fail to cancel your automatic delivery well in advance of the next delivery the purchaser will be accountable for any and all money owed for any deliveries made. Call our office for details. When should I request an oil delivery? Will-Call customers should order when the oil tank gauge reads 1/4 full. Please allow anywhere from 1-4 business days for delivery depending on your location. Automatic delivery customers do not need to call to place an order once they have established an account with us. We track oil usage of our automatic delivery customers and send a truck "automatically" to the customer home to ensure the tank remains full. That said, even automatic delivery customers should be aware of the oil level in their tank to prevent runout and frozen pipes. 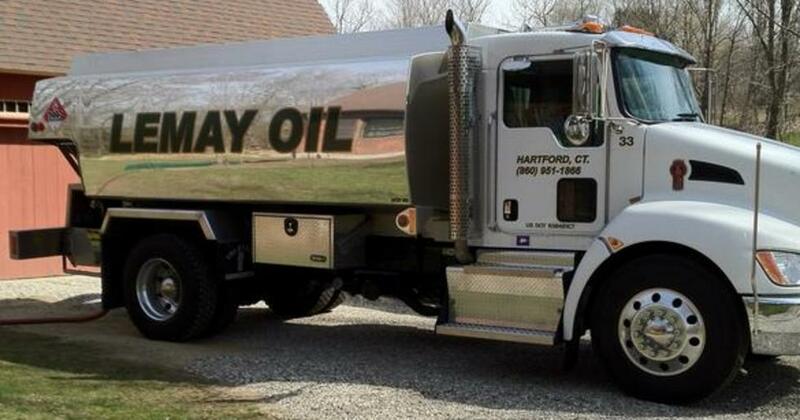 Lemay Oil offers 24 hour emergency service for our existing oil delivery customers. We do have a service contract for oil heat equipment. You must be on automatic delivery and your equipment must be inspected before we will take you as a client with a service contract. Call our office for details. Avon, Berlin, Bloomfield, Bolton, Berlin, Coventry, Cromwell, East Hartford, East Windsor, Ellington, Farmington, Glastonbury, Hartford, Manchester, New Britain, Rocky Hill, Simsbury, South Windsor, Vernon, West Hartford, Wethersfield, Windsor, Windsor Locks.